The Sefer Ha’Eshkol (authored by Rabbeinu Avraham Av Bet Din, one of the great Rishonim, page 68) writes that one should recite the Blessing of the Trees during the month of Nissan, however, this does not mean that the blessing must be recited specifically in Nissan; rather, this refers to the first time that year that one sees the trees blossom. Similarly, the Ritba (Rabbeinu Yom Tov ben Avraham Elasvili) in his commentary on Tractate Rosh Hashanah (11a) writes: “This does not necessarily mean Nissan; rather, every place based on when the trees blossom there.” Many other Poskim rule likewise. Thus, one may recite the Blessing of the Trees based on whenever the blossoming of the trees occurs in one’s current location, for there is no specific requirement for the blessing to be recited in the month of Nissan; the only requirement is the spring blossom, which usually occurs during Nissan. The Poskim disagree whether or not the Blessing of the Trees may be recited on Shabbat. We have already written about this topic in the past. Halachically speaking, according to Maran Rabbeinu Ovadia Yosef zt”l, it is permissible to recite this blessing on Shabbat according to the letter of the law especially on years when Rosh Chodesh Nissan coincides with Shabbat and there is a concern that if this blessing is not recited by the entire congregation on Shabbat, there may be those who will treat this blessing lightly and not recite it later at all. In such a situation, it is certainly preferable to recite the Blessing of the Trees on Shabbat. Indeed, Maran zt”l behaved this way in his older years when he and the members of his synagogue would walk down the road and recite the Blessing of the Trees on Shabbat. Hagaon Harav Shlomo Zalman Auerbach zt”l behaved likewise. Similarly, if, for whatever reason, one has not yet recited the Blessing of the Trees and then sees blossoming trees on Shabbat, one should recite the blessing right away so as not to miss saying the blessing entirely. Some say that one may only recite this blessing when seeing a minimum of two blossoming fruit trees. Others rule that seeing one tree is sufficient. 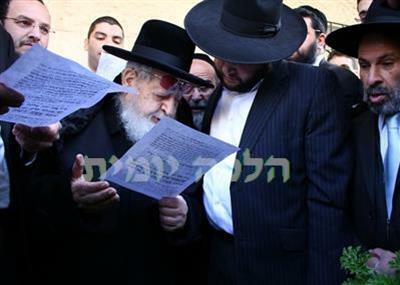 In pressing circumstances, Maran Rabbeinu Ovadia Yosef zt”l writes that one may recite the blessing on one tree. Nevertheless, it is especially praiseworthy to recite the blessing on several different kinds of fruit trees. However, there is much room for leniency in this matter regarding trees which are not so clearly forbidden to graft, such as citrus trees including citron, lemon, “Chushchash” (wild oranges), and grapefruits, for according to Maran Rabbeinu Ovadia Yosef zt”l (see Responsa Yabia Omer, Volume 5, Chapter 19 and Halichot Olam, Volume 2, page 200), one may instruct a non-Jew to graft such trees with one another. Based on this, the existence of such trees is certainly not against Hashem’s will and the Blessing of the Trees may be recited on them just as it is customary to recite the “Shehecheyanu” blessing on such fruits, as we have explained in another Halacha. Hagaon Rabbeinu Chaim Palagi writes in his Responsa Lev Chaim (Volume 2, Chapter 45) and Sefer Mo’ed Le’Kol Hai (Chapter 1, Section 6) that one should preferably recite the Blessing of the Trees specifically outside the city. He derives this from the words of the Gemara and the Rambam which state that this blessing was instituted for “one who goes out during the month of Nissan”; it is therefore improper to recite this blessing inside one’s home. Several great sages followed this practice, among them the great Geonim and luminaries of Yeshivat Porat Yosef Harav Yehuda Tzadka, Harav Mansour Ben-Shimon, Harav Ben-Zion Abba Shaul, Harav Yosef Ades, Harav Yehuda Moalem who would travel to an area near Bet Shemesh every year to recite this blessing. Nevertheless, many great Poskim did not customarily follow this stringency quoted by Rabbeinu Chaim Palagi and even he writes that his grandfather, Hagaon Harav Yosef Refael Chazzan, Rishon Le’Zion, author of Responsa Chikrei Lev, and one of the greatest luminaries of the generation, would customarily recite this blessing in the courtyard of his home. Similarly, the great sages of Istanbul would recite this blessing while looking out their window at the trees outside. Maran zt”l and those who prayed in his synagogue would likewise recite the Blessing of the Trees close to his home and he would not travel outside of the city to do so.